Even if the feedback you receive is negative, remember that it concerns your work, not you personally. Try to put yourself in the client’s shoes - they not only want your best work, but also the best possible fit for their vision. Do what you can to understand what improvements you need to make while focusing on the client’s business goals. Ask questions and be patient. If you forget your ego and put all of your focus on the client, they will feel reassured by your dedication to their project. You don’t have to treat negative feedback as a failure - it’s an opportunity to learn more and fine-tune your designs. 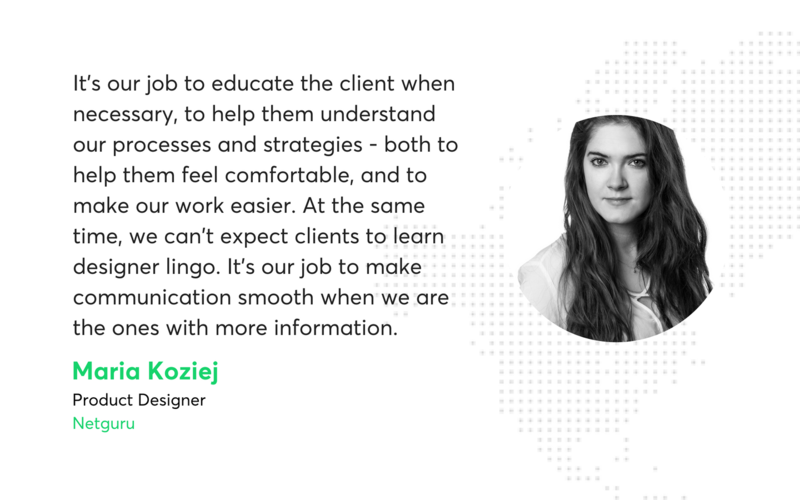 The client doesn't know as much as you about design. 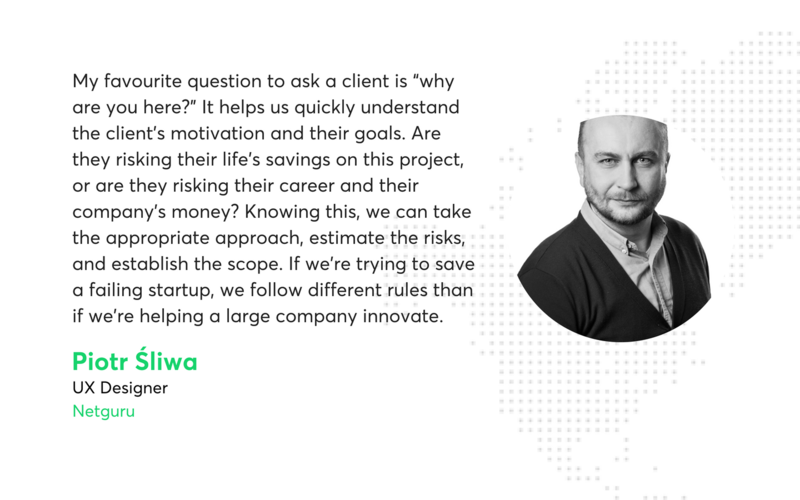 They might need you to explain certain terms or concepts, perhaps even to show them why your process and methods are the best way to go about designing their product. Always be active and transparent, even when you're dealing with blockers. The client should be able to see you as a human being, just as vulnerable to the whims of fate as themselves. Think ahead - if a client has a bad idea for a solution, you have to point it out. It’s going to pay off later in the project. The client most likely knows more than you think in terms of business, marketing and the specifics of their market. Rely on this knowledge - you're not a magician, you don’t have to pull brilliant ideas out of your hat. Don’t just send updates to the client - collaborate, discuss and figure out problems with together. You have a well of knowledge right there, probably eager to tell you all about their vision and ideas. Use it. Always share your concerns. This way, you will let your client know that you care about the project. Don’t be afraid to challenge the client to make better decisions and rethink concepts, but don’t be aggressive. Your recommendations should be softly presented, thought-provoking and supportive. Never just say “no” – try using the phrase "why don't we..." instead. The golden rule is to listen more than talk. Ask questions and try to capture as much of what you learn as possible. Take a notes. Always be prepared for a daily call. If you can, you should use expressions and mannerisms similar to your client’s. It’s been scientifically proven that mirroring someone’s posture as you talk to them, for example, makes them open up to you more readily and feel more at ease. And remember not to interrupt the client when they’re talking! That’s a surefire way to make them feel like you don’t care about what they have to say. Be yourself! Smile a lot, keep your posture and mannerisms open (you can read up on body language a little bit, it definitely won’t hurt) and make sure the client knows you’re actually hearing what they tell you. Try to really involve the client in the project. Educate them about the flow of the design process and share all the knowledge they’ll need to cooperate with you as an equal. 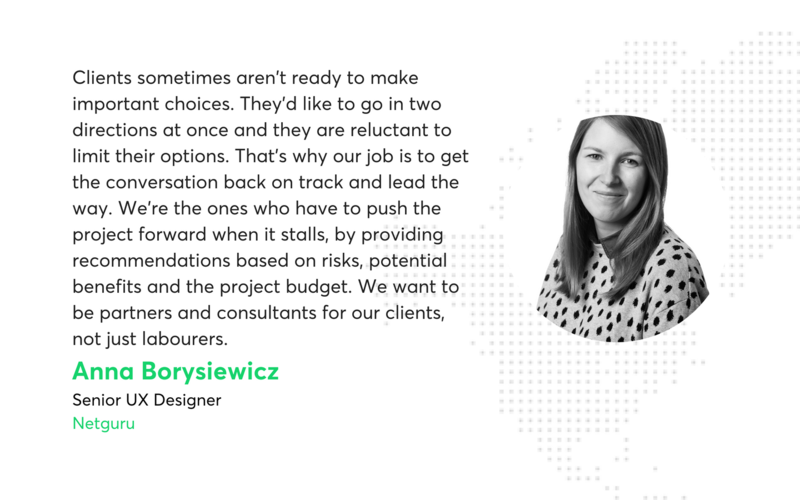 If the client starts a project knowing the important stuff, they’ll be more ready to offer up ideas and more proactive in telling you what you need to know. Show that you are a part of the team – the client’s team, that is, not just your team doing some work for them. Let the client feel that you are doing this magic together. And let them help! Try to never get in the client’s way, especially when they ask for your help or try to build off your work. Ask your clients about their business goals, not visual preferences. You’re supposed to know what designs work, and the client knows how their business and market operate. Preferences are much less relevant than experience and hard data. Be patient and always avoid conflict. You want open discussions during which all sides feel comfortable enough to share their ideas, not confrontations. Try to explain your point of view in a calm and logical way. Empathise with the client’s point of view and do your best to understand their worries. Agree whenever you can, even with the smallest things. Every time you say “yes” or “that’s right”, the client will feel like you’re on their side. Remember that they are a lot more invested in the project than you are and respect that. There’s nothing worse than the client seeing you as an adversary. When you need to point out a problem or disagree with the client on something, always propose a solution. Be prepared for these eventualities and have them in the back of your head. Treat your client as you would team member - you’re working on a project together, and it’s never helpful to simply tell someone that they are wrong. If you just give short, huffy answers, the client will feel like they’re talking to a teenager. Don’t deal in absolutes when you can help it. Saying that something is impossible to do, or that something proposed by the client makes no sense is a mistake, especially if you don’t follow it up with a good explanation. It might be better to lead the client to these conclusions instead, by presenting them with fact they can follow. Then share your ideas on what could work better and invite the client to offer comments on them. You need to create a friendly relationship with your client. Remember that you're in this together and emphasize your investment in the project. When presenting your work, always talk about the rationale behind your decisions. Let the client understand the process you follow and what the outcome of each of the steps is. It's okay to say "I don't know" - don’t ever be tempted to cover up your lack of knowledge with a lie - but be sure that your client expects "but I will find out" as a follow-up. Don't play smarter than you are, and don't show your client up or try to make it seem like you know more than they do. You're equals. 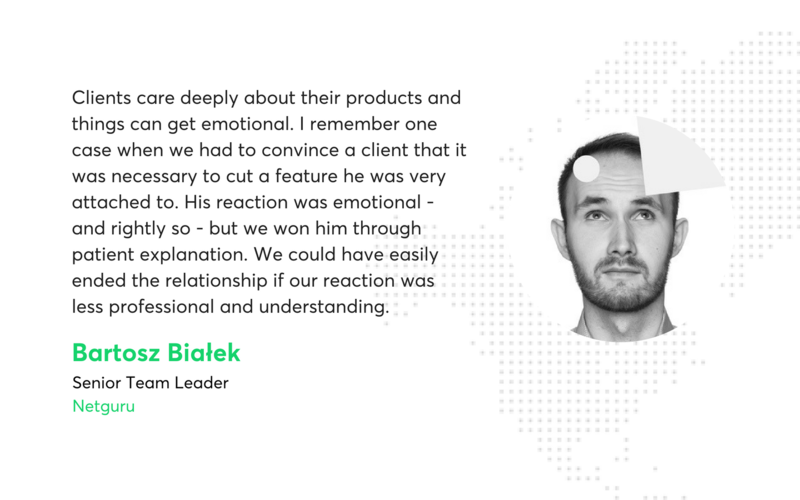 Don't overreact in front of the client. It’s good that you care about the project and the quality of your work, but sometimes good intentions might lead you astray (e.g. when the business goal is to get something out fast, and the quality is secondary). Control your emotions when they client is angry and stressed out, too. Sometimes, trying to empathise with them might help - think about the possible reasons for the client’s short temper, like problems at home or chronic pain, for example. Remember that you’re talking to a person who is as complicated as you are. Also, remember that other people’s words can’t actually hurt you - but your own can. Snapping at the client can damage your career. This doesn’t mean you should let the client push you around! Be firm but patient, and try to diffuse conflicts before they ramp up. You’re the one who faces these sorts of situations regularly in your professional life. You need coping mechanisms anyway, and the client might be completely new to having other people shape their beloved project. Never use buzz shmuzz phrases like "you will be satisfied." That's an overpromise without a measurable way to confirm it. 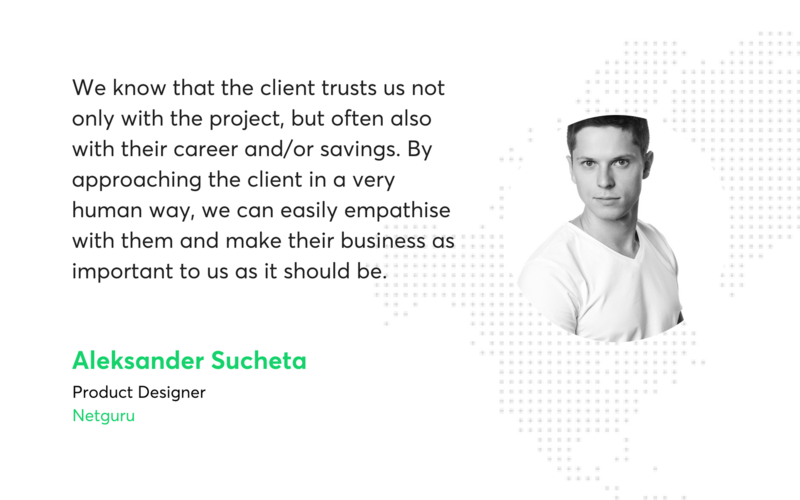 Instead of that, let the client understand that you truly care for the project. Also, never be afraid to communicate your doubts or mistakes and don’t hide them behind vague phrasing. Nobody knows everything and miscommunication is expensive. And anyway, nobody likes a know-it-all. You should generally avoid talking about yourself, and steer especially clear from self-praise. This is basic, but try to treat you client like a person with emotions which can be hurt. Don't say they don't know anything about design. Don’t tell them "I have nothing for you today". 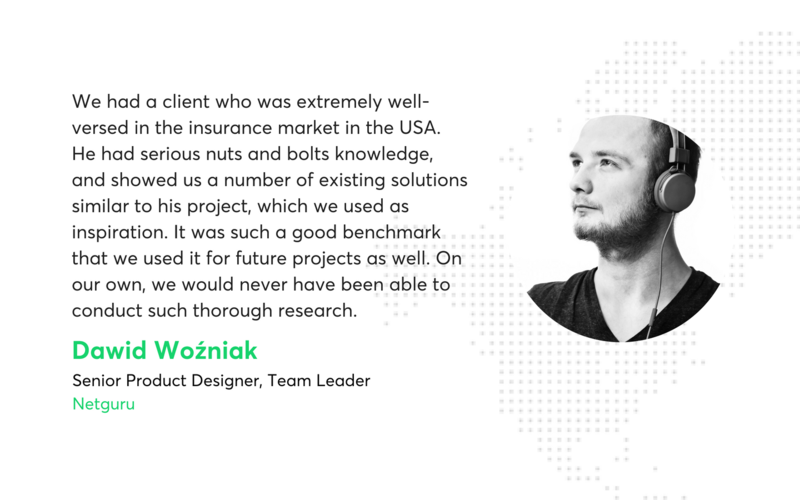 The client’s excitement about the project is extremely important - if maintained, it’ll mean that the client will be eager to answer your questions and find information for you. You also need the client to like you - not necessarily on a personal level, but as the person responsible for a vital part of their project. Showing that you’re a decent person will do a lot in your favour. Sometimes, the lack of a decision is worse than making the wrong choice. The client values you for your expertise, not for catering to their whims. Don’t ask about their favourite colour - propose a solution and, if needed, explain why you think it’ll work. At the same time, don’t feel pressured to have all the answers right away. If you need some time to come up with a decision, say it. The point is to communicate that you agree to take on the responsibility for solving this issue. This isn’t the first time we tackle the problem of communicating with clients and building good relationships with them. Check out our previous article on this topic and let us know what you thought about this one!